I’ve been loving the Spanish wines making their way into Costco recently and this big red blend falls in line nicely, offering huge flavor and complexity for only $10.99. These Spanish reds (and even the recent whites like this Albarino) offer just ridiculous value compared to what you will find from other places in the wine world. 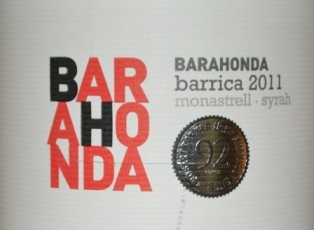 This wine is a blend of 75% Monastrell and 25% Syrah. Interesting nose that is both floral and spicy. Flavors are dark fruit, blackberry, anise, and hints of leather with a touch of oak. The finish lasts quite a while. This is a hearty wine. It says medium to full bodied on the label, but I’m leaning much more toward full. Pair this with a nice red meat dish, steak on the grill would be perfect, or something big that can stand up to the massive flavor packed in here. Again, at $10.99 this is a clear buy for anyone who likes huge old world reds. You wouldn’t be disappointed if you paid twice as much for it. Parker scored this wine a 92. I’m going to be right at 90 points (89 plus a value point).